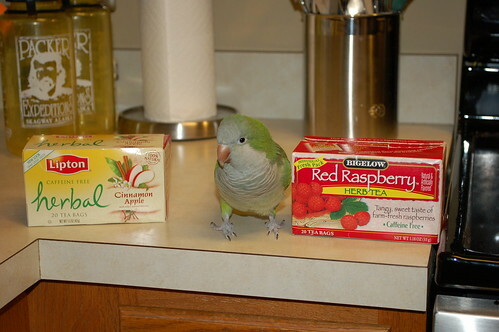 Is Tea Safe For Parrots? This question came up on the BirdTricks facebook the other day. In order to answer this question, I think it is important for you to know what tea is and how it is sometimes used. This way you can make an informed choice for your birds. Simple enough! Tea is a beverage made by brewing the leaves, buds and twigs of the tea plant (camelia sinensis) in hot water. After allowing the tea to steep for a few minutes, the plant is strained out. The longer you allow the tea to steep, the more potent the beverage becomes. There are four basic teas: white, black, green and oolong. Herbal teas are misnamed because they are not actually made from the tea plant. Instead, it is made from various plant parts such as roots, flowers, seeds and leaves and prepared as a tea. Herbal teas are used for physical and medical purposes. What is a flavored tea? Flavored teas actually are a true tea. They are made from the tea plant with plant parts used for flavoring. So peach ginger tea is made of leaves from the tea plant with peach and ginger plant parts added for flavoring. Teas naturally have less caffeine than coffee, and through processing can be decaffeinated up to 99%. A tea box marked caffeine free has to have at least 97% of the caffeine processed out. A box marked naturally decaffeinated means that the process of removing the caffeine was not done with synthetic chemicals. I don’t even want to think about my birds hopped up on caffeine. What kind of tea can I give my parrot? 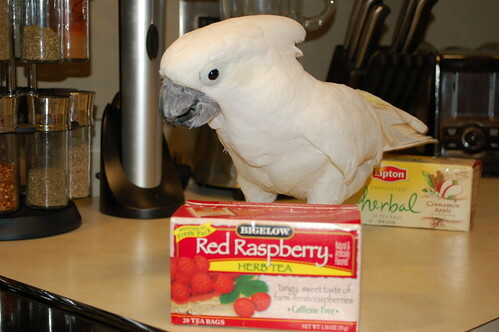 Decaffeinated flavored teas are fine for your birds provided that they are flavored with ingredients that are appropriate. Avocado and chocolate or cocoa teas (yup, they exist!) are obviously bad choices. Look at the ingredients and make sure they are bird safe. Most fruit flavored teas will be fine. Since herbal teas have been used for medicinal purposes throughout the centuries, it is important to know what the effects might have on your birds. Many teas are used as stimulants or sedatives. Some are used as anesthetics, others are used for specific ailments. Unless otherwise recommended by your vet to help combat a specific health problem, I would stick with Chamomile teas, made from the flowers of that plant. Chamomile has a mild calming effect and makes a wonderful bedtime drink for both you and your just-ten-more-minutes-mom parrot. It is probably a good idea to look for teas that name themselves after the ingredients, like green apple tea. Best to avoid extreme names like: Holy Cow! or Dead To The World Tea. The ingredients might be a bit too harsh for little Sweet Pea. How do I prepare tea for my parrot? Make your tea as usual. Before you add anything to your tea, take out 1/4 cup and put it in your birds cup. 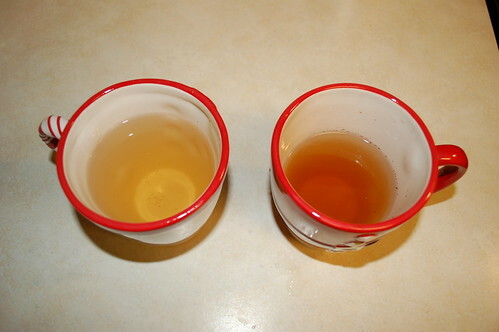 Dilute the parrot tea with 3/4 to 1 cup water. If you make your tea strong, dilute your parrot’s with more water. Make sure you allow it to cool before serving. Many birds will drink tea plain, but if you do decide to sweeten it (no milk please!) try not to use sugar. We all know that white sugar is not great for us, but did you know that brown sugar is usually just white sugar with molasses added? You can use honey, but only PASTEURIZED honey. About 60% of the raw honey available today contains enough botulism to be harmful to parrots and infants. How do I get my bird to drink tea? Remember the parrot’s simple motto: If it’s mine, it’s mine. If it’s yours, it’s mine. If you’re holding it, it’s mine. And if you are looking at it or thinking about it, as soon as I figure out what it is, it’s mine. Prepare a cup of tea for yourself, and one for your parrot (as above). Be sure that you use a suitable size cup for your species of parrot. A small bird could fall inside of a coffee mug and drown. Let him watch you enjoy drinking yours, and then offer his cup. The typically nosy parrot will investigate. If your vet has placed your parrot on tea therapy, you can replace the drinking water with a bowl of the recommended tea. 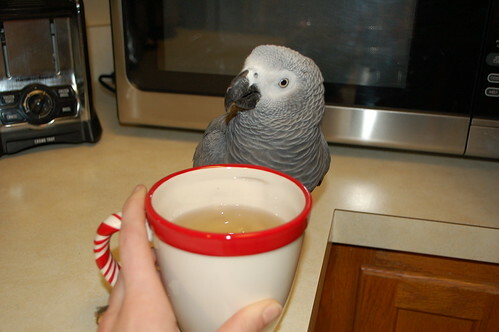 For the parrot that doesn’t care for tea, a cup of warm water will often do. This way you can both still enjoy the bedtime ritual. Author Patty Jourgensen specializes in avian health, behavior and nutrition and has been working with and caring for rescue birds since 1987.